Estill County High School’s Future Problem Solving team competed in the Kentucky State Governor’s Cup Competition at the Galt House in Louisville March 13-15 and placed second. Haden Barnes placed first in high school alternates FPS. Gov. Steve Beshear presented their trophy. 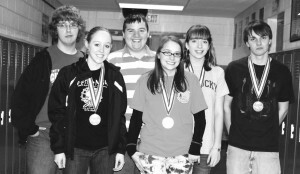 The team qualified for state by winning on both the district and regional level. The next stop for them is the International Future Problem Solving Competition at the University of Wisconsin in LaCrosse, WS. June 10-13.Team members are front row, from left Natascha Richardson and Amy Morgan; back row, Haden Barnes, Tanner Chaney, Erin Combs and Ryan Walton.